Handy Hearts is dedicated to provide resources for cancer patients to treat the body as a whole; nutrition counseling, personal training, massage therapy, chiropractic care & physical therapy. In addition, a one room home remodel will also be provided. 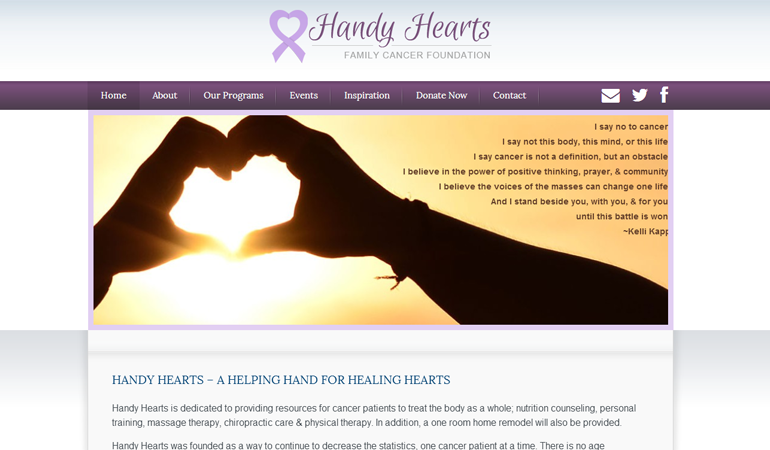 Handy Hearts was founded as a way to continue to decrease the statistics, one cancer patient at a time. There is no age requirement or limitation, but home ownership is a must. The homeowner can either be the patient, or the parent of the patient. Handy Hearts, Inc. understands most healing time is spent in the home, and since home is where the heart is, we will provide a one-room makeover or install medically required equipment to help heal the heart and spirit. Handy Hearts firmly believes in treating the body as a whole through nutrition and exercise, the best line of defense in battling cancer. In addition to a home remodel project, we will provide the funding for 8 weeks of qualified, professional therapies such as: nutrition coaching, massage therapy, personal training, & also, chiropractic care/physical therapy when the insurance policy does not cover these services.